We offer a stylish range of stainless steel kitchen tools, which is flawlessly designed to suit with the decor of your contemporary kitchen. 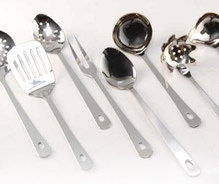 While manufacturing these kitchen tools, we use best quality raw material, which we procure from reliable vendors and check their quality before utilizing. 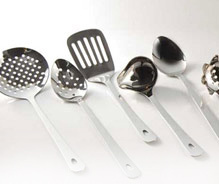 Our kitchen tools are available in different shapes, sizes and finish and well suitable for Indian as well as western cuisine. We offer our world class range at market leading prices. 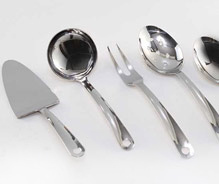 The complete set of kitchen tool features beautiful mirror finish and functional design. Easy to maintain, the set complete resistant stain and can be easily maintained. An essential requirement for every kitchen, this kitchen tools simplifies the process of cooking and makes serving a pleasures. 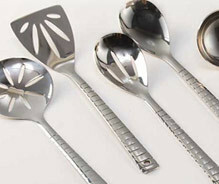 The innovative design of this hook spoons provides comfortable grip and are easy to store. 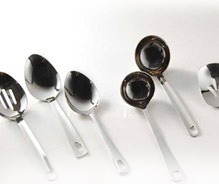 Resistant to dust and stain, these hook spoons are dish washer safe. Premium kitchen tools W/color handles contemporary, stylish and convenient to use, this kitchen tool set is sure to impress at your next social gathering. It is also ideal for everyday use. 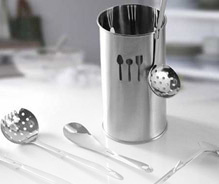 Excellent kitchen tools with a beautiful high quality brushed stainless steel finish. 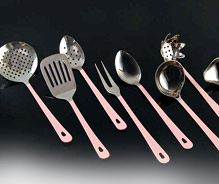 This set is ideal straining, serving and grating purposes. 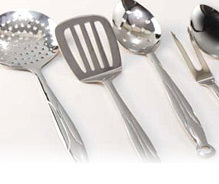 Made from quality stainless steel, our range of premium kitchen tools are highly durable, light in weight and easy to clean. A wide flaring mirror-finished pattern, lara 9 inch serving tools combines clean cut and beautiful shape along with robust construction. The zack kitchen combines durability with an elegant design to give the home cooking enthusiast tools that can be displayed with pride and used with confidence.